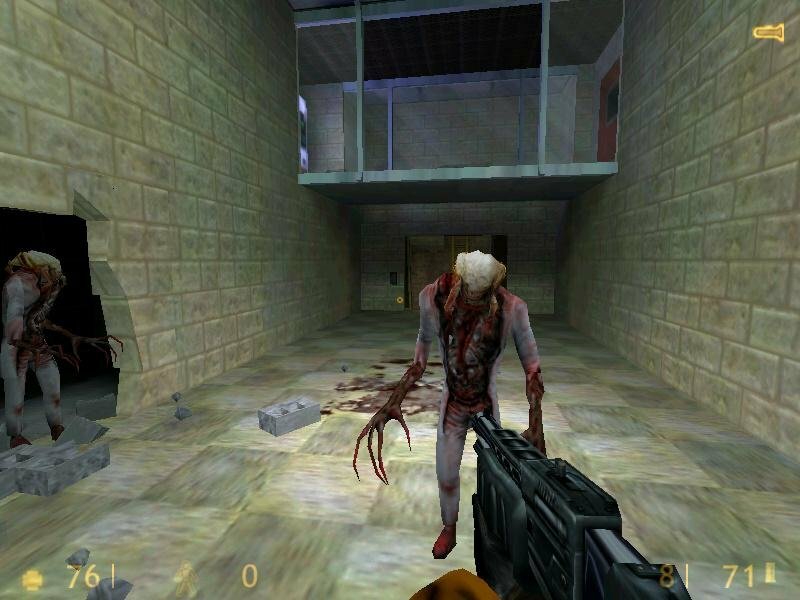 Half-Life is here, and it’s still one of the best first-person action experiences ever. 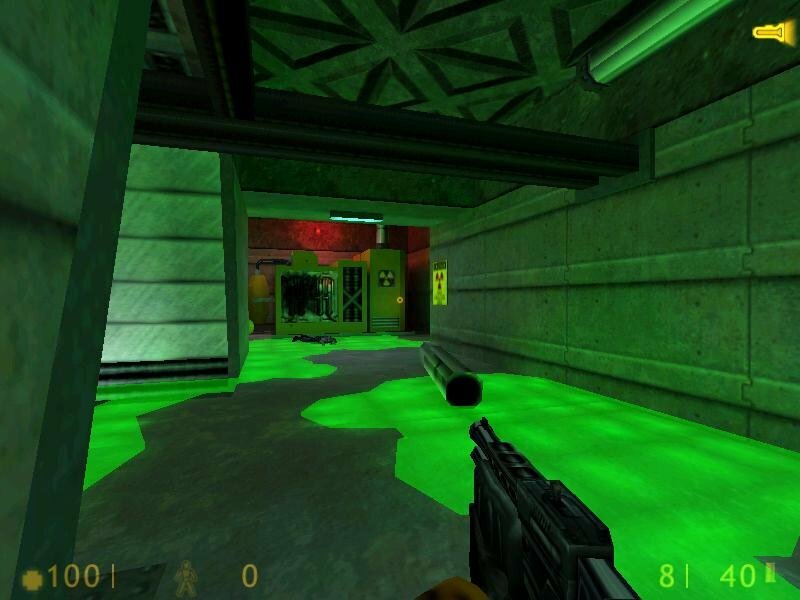 This is the sort of game that elicits endless, near quasi-religious praise from people that were around when it was hot, equating Valve’s defining first-person masterpiece to such revolutionary games as Quake, Doom or Wolfenstein 3D. Shall we dispense the formalities and get to it? 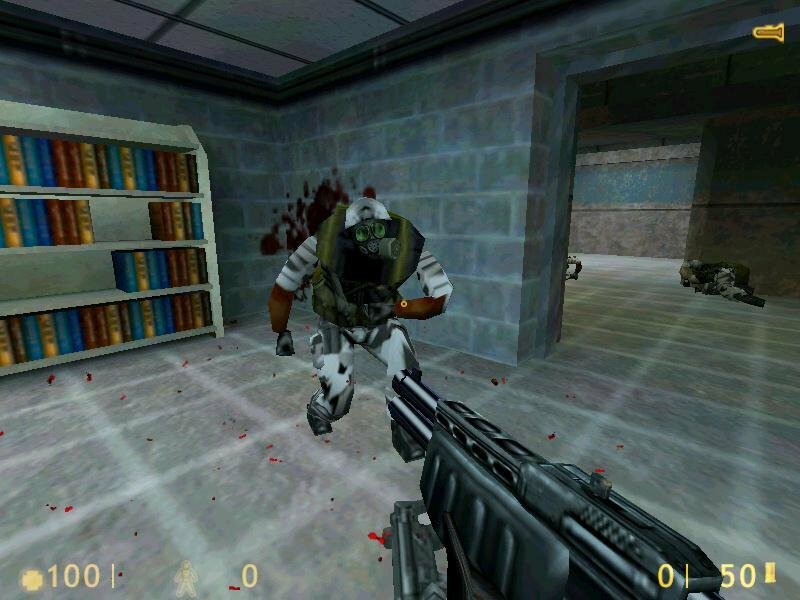 Let’s first honestly ask – why exactly is Half-Life great, and why is it so frequently touted as possibly the best PC game ever made? The important word here is ‘immersion’; and the means of achieving it are realism and plot. 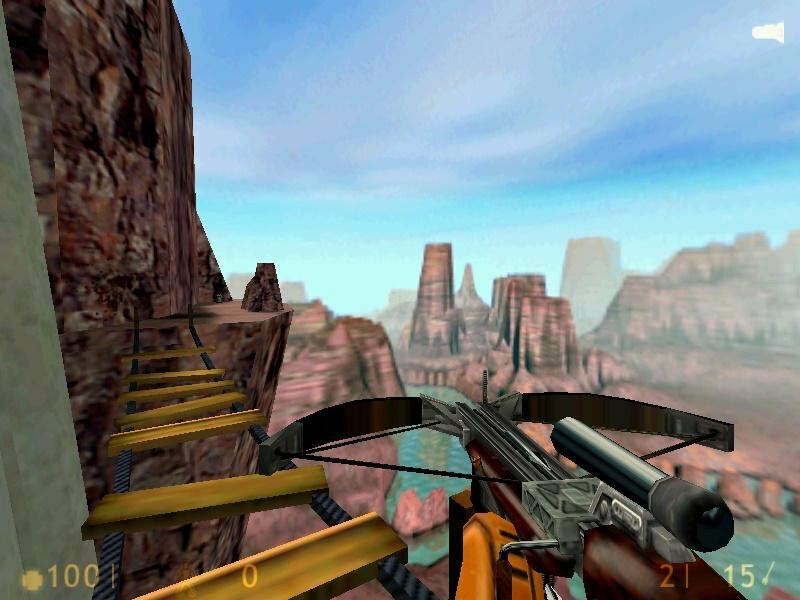 The game world in Half-Life is alive, breathing with purpose. Every scene you play through, every level you visit is part of a greater whole, and every location is, more or less, logically grounded in reality. All your fellow scientists have been offed. 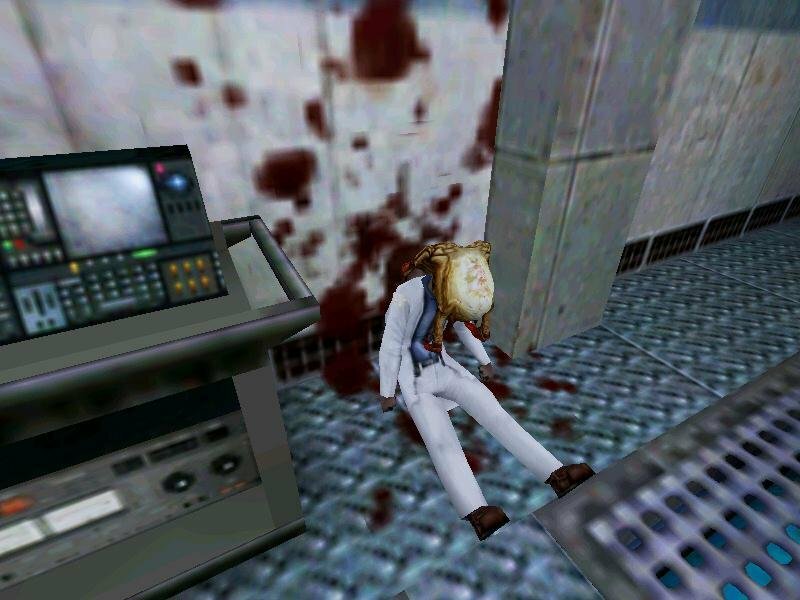 The game’s hallmark tram ride through the secret science facility perfectly illustrates this. 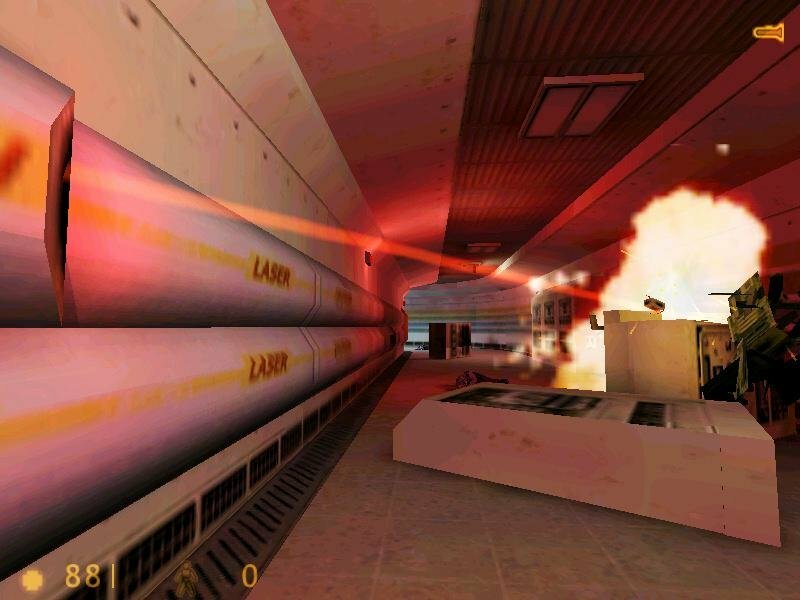 Half-Life unconventionally lets you start the game by experiencing a normal day’s work inside a top-secret underground research facility in Arizona. More so, you get to enjoy this experience through the eyes of your protagonist, a top research scientist on the government’s payroll, adding tremendously the sense of actually being there. 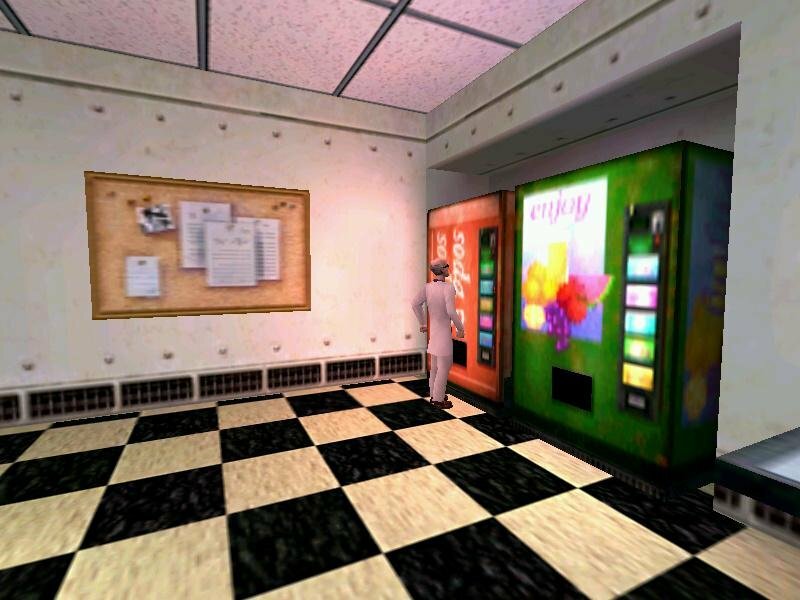 it makes the game world feel eerily believable, only to wildly distort it later. 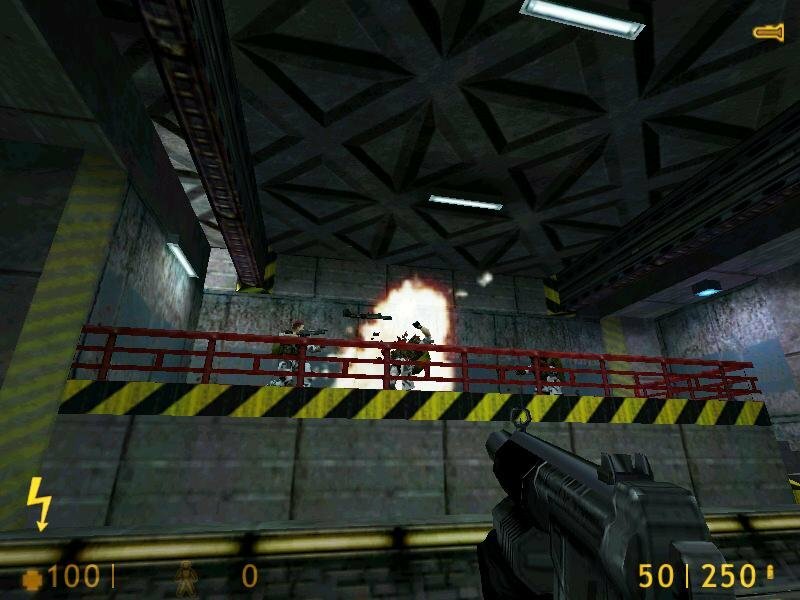 The story continually unfolds in Half-Life. 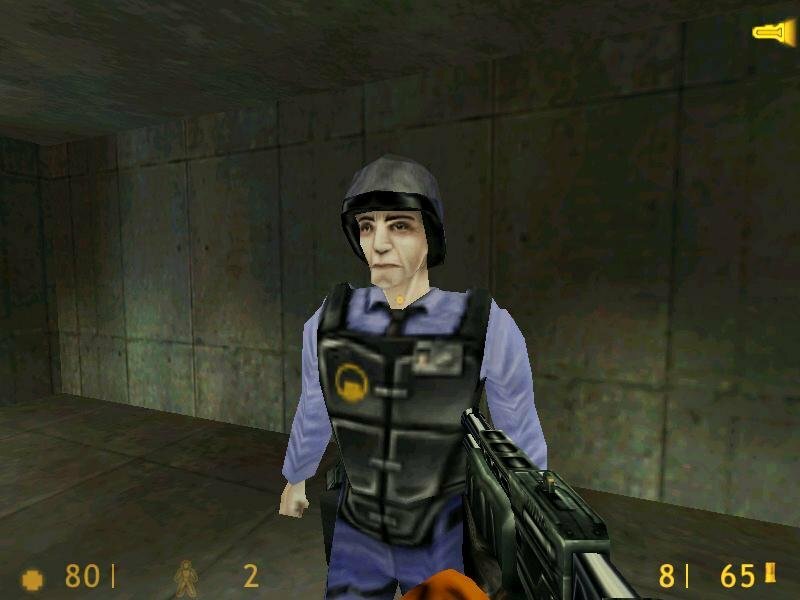 You play the role of one Gordon Freeman, theoretical physicist working on behalf of the military in an underground research complex called Black Mesa. It’s a routine a day until a botched experiment (which you partake in) rips the space-time continuum and destroys parts of the complex, simultaneously opening a gateway to an alien world. It’s the ‘ripping an inter-dimensional gateway‘ part that poses the greatest threat, as aliens continually flood into the sealed super-structure, with little resistance from your fellow scientists or poorly armed security personnel. 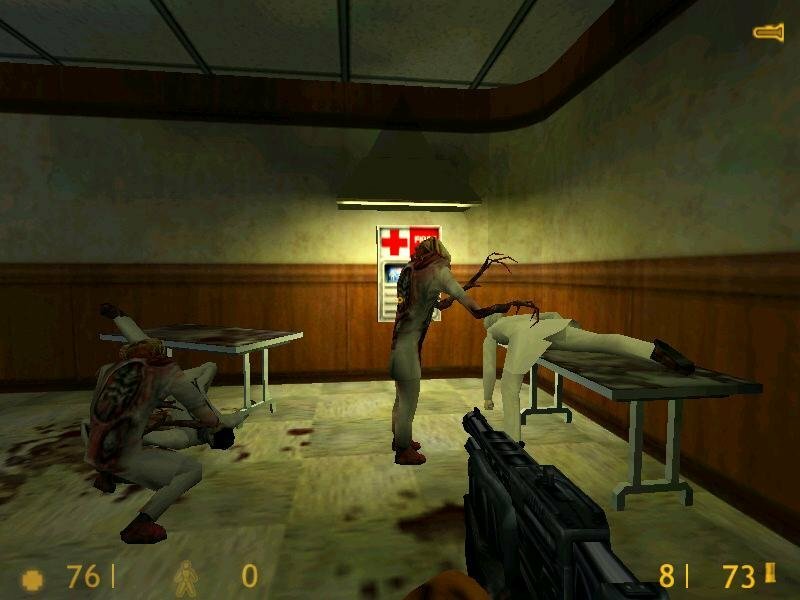 Equipped with a special hazard suit, your only chance of survival is making it to the top, continually dodging collapsing floors, creepy aliens, automated turrets and military operatives sent in to blow up the place and wipe out all of the evidence – including you. 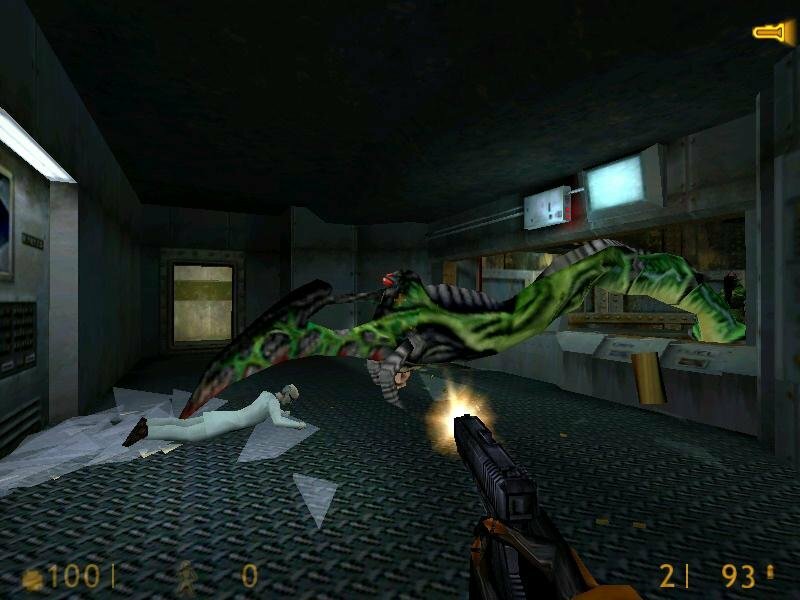 The inter-dimensional aliens motif could have been a menacingly derivative plot device, but Half-Life breathes new life into the concept with its stylish, story-driven execution. A fantastic marriage between action and narrative is immediately apparent, flawlessly integrating important story twists into gameplay and delivering a more cinematic feel like no other game has done before. 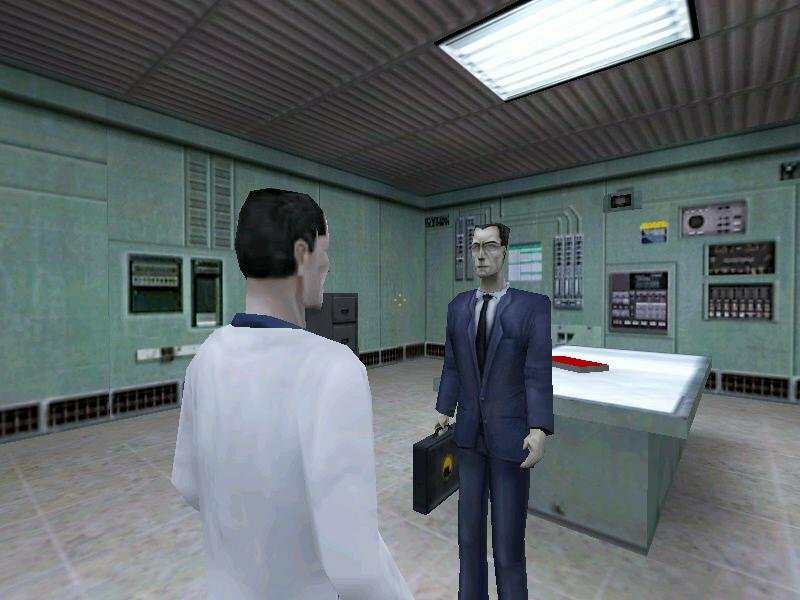 To this end, Half-Life lets you witness key moments of the story on-site and within full control, giving the player a sense of ‘there’ by not yanking the camera away for an ingame cutscenes. 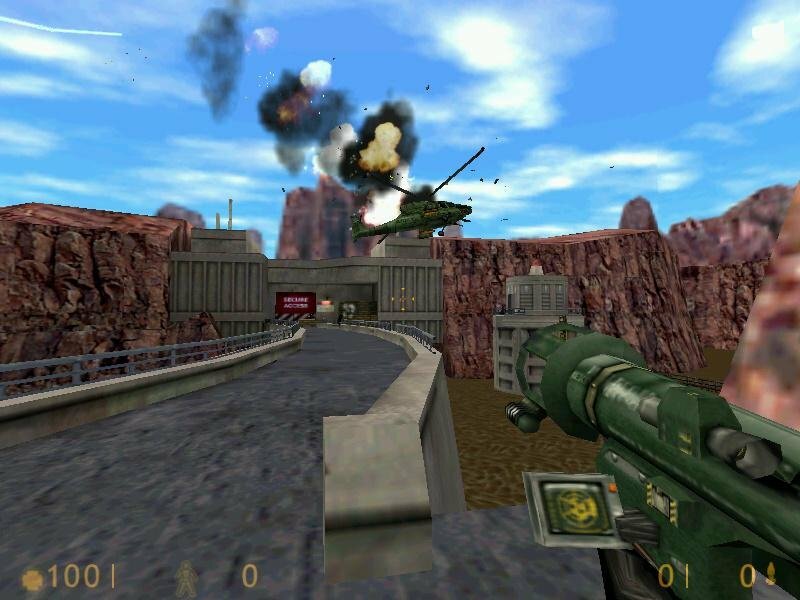 Plus the game world at large is pretty unpredictable, which adds greatly to the tension. 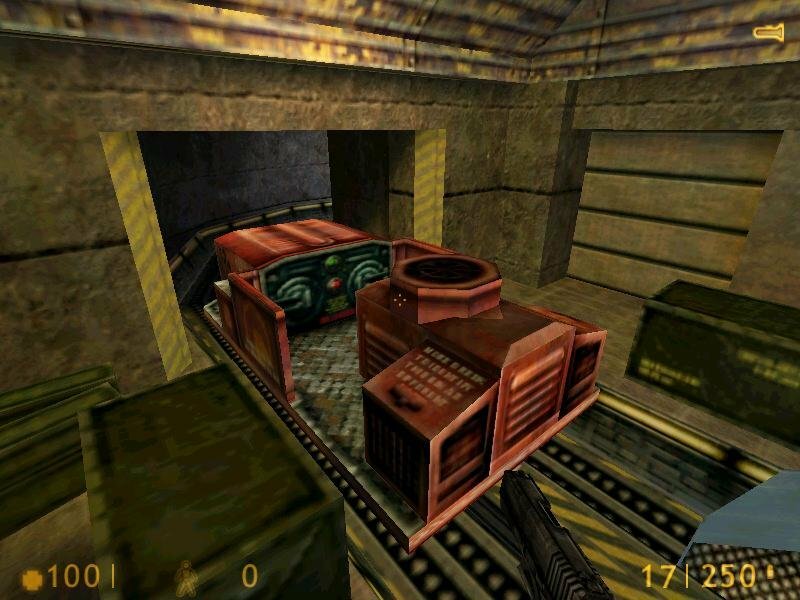 You could walk into a room and an alien might come crashing through a window, or a giant piece of debris will fall just a few feet of you, or that pipe could burst and shower you with scolding steam. Scripted events like these are all over the place and give the environment and the story a dynamic, authentic feel. The AI helps complement this feeling considerably – people are infused with genuine panic and confusion within the first few minutes of the disaster, scientists plead for help, a dying security guard tries to reach for a first-aid kit, a gigantic alien stomps on the ground, causing a section of the wall near you to collapse and reveal a flaming gas pipe. The world is brimming with danger, and you must always be on your toes. Your trip to the surface is wrought with danger after the incident and every corner of the now-mangled innards of the research complex will have you face a different threat. The aliens, far from being cliched, are all skillfully designed. 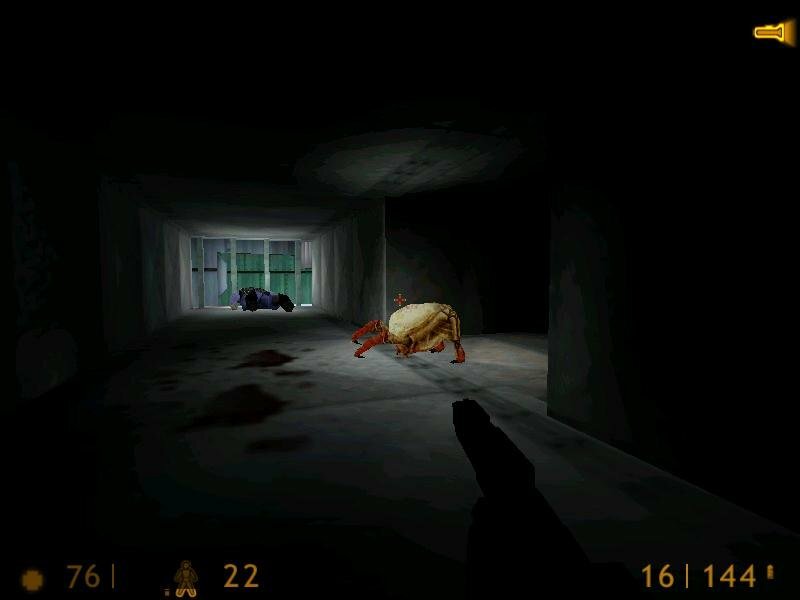 The iconic headcrab is a creature that tries to latch unto its victim’s face and take control of its movements like some terrible parasite, effectively turning the unlucky host into a helpless zombie. 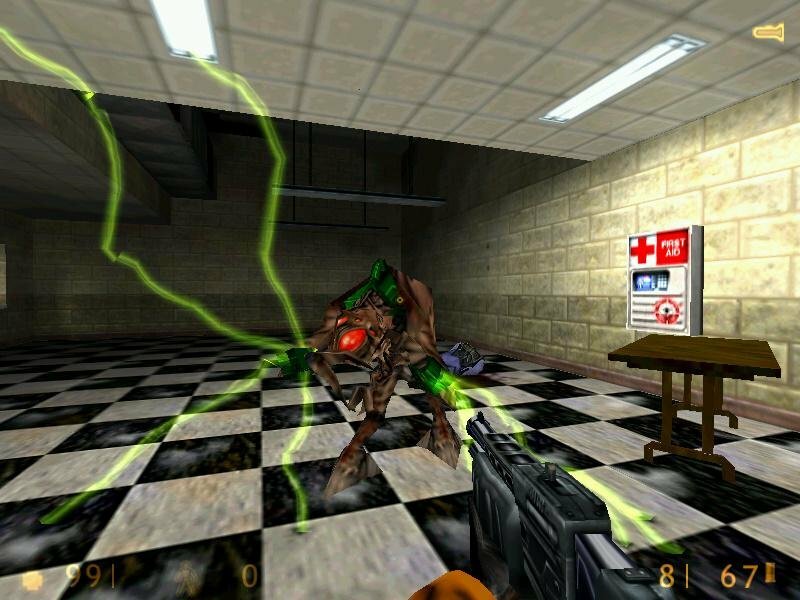 Houndeyes are three-legged dog-like monsters who hunt in packs, charging up and delivering sonic blasts that numb you. The Ichthyosaur is an appalling underwater dweller with a huge, gaping mouth, made all the more terrifying by the fact that most of your guns don’t work underwater. 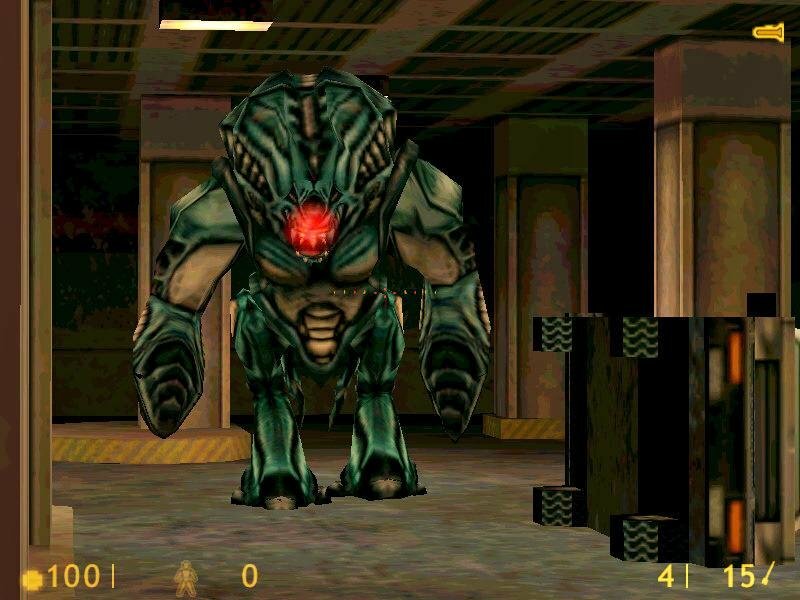 Yet easily the most imposing and terrifying alien monster is the Gargantua, an enormous and determined behemoth that’s exclusive to Half-Life and none of its sequels. 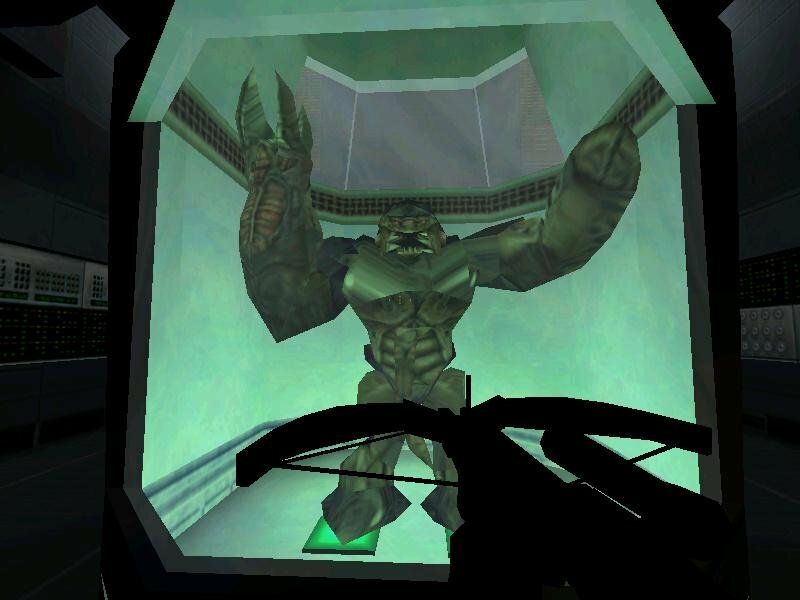 The Garg encounters offer some of the best moments in action gaming – near impossible to kill using conventional weapons, you must escape their grasp by hiding in tunnels and plotting a means of killing them using the environment itself. One encounter will have you lead the creature between two electric coils to destroy it, a dash made all the more terrifying by the Garg just about matching your own running speed. 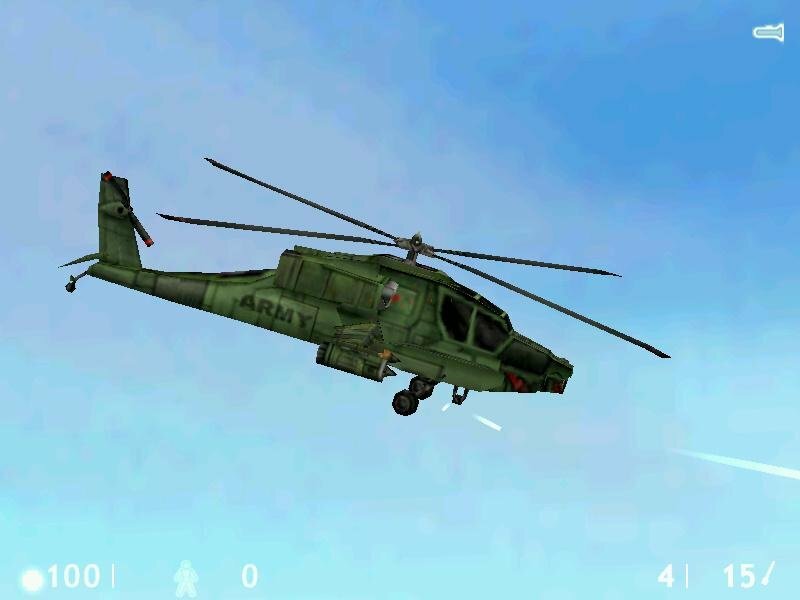 You’ll also fight a host of human opponents as well, including marines sent in to kill the science teams, incredibly agile CIA operatives and attack choppers that will literally blow you away with a volley of rockets. 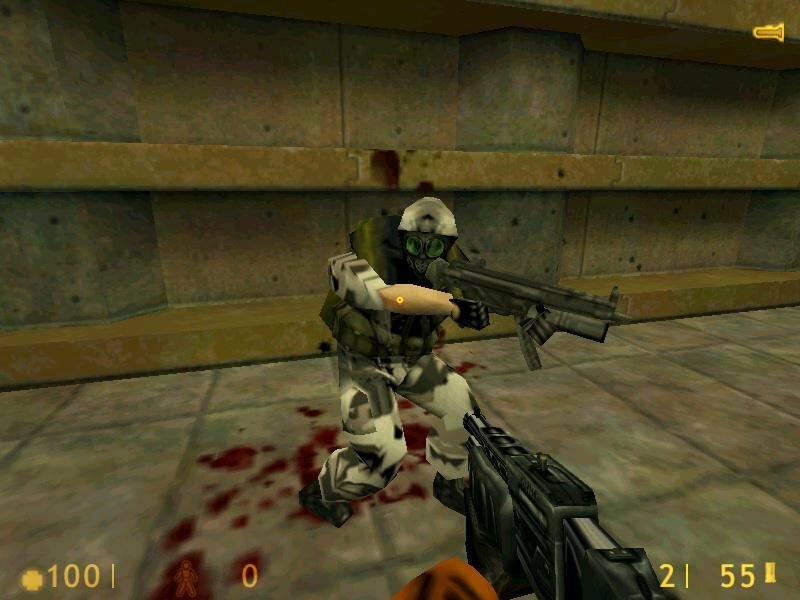 A lot of work has been put into both human and alien AI, and soldiers can be seen working as teams, constantly attempting to flank or flush you out with grenades. 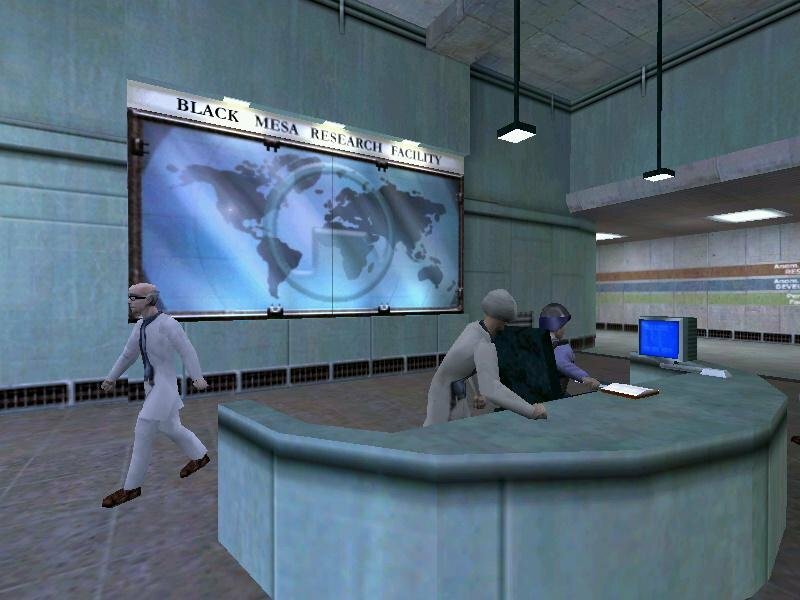 The first part of the game is spent trying to survive through what’s left of Black Mesa, and the levels themselves constitute an endless array of creative design. 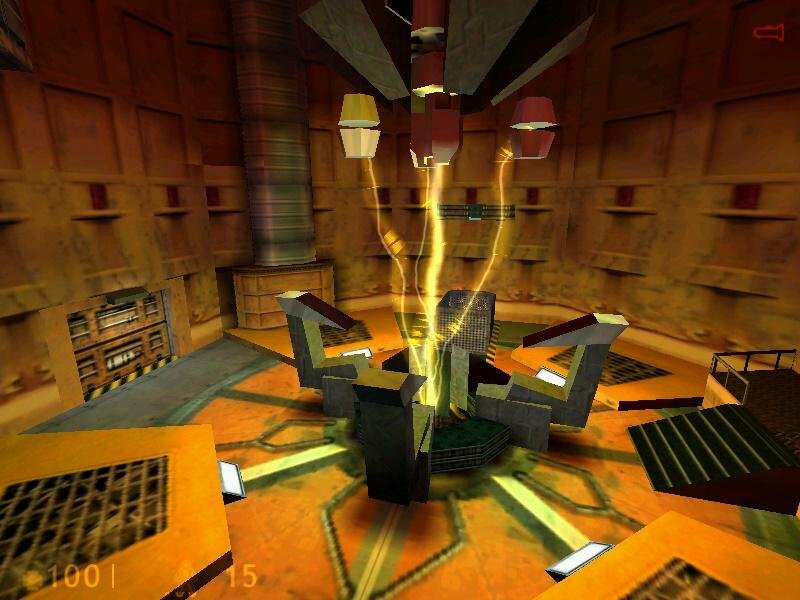 As you make your way through the facility, you’ll eventually come across simple puzzles, most of the switch flipping variety. 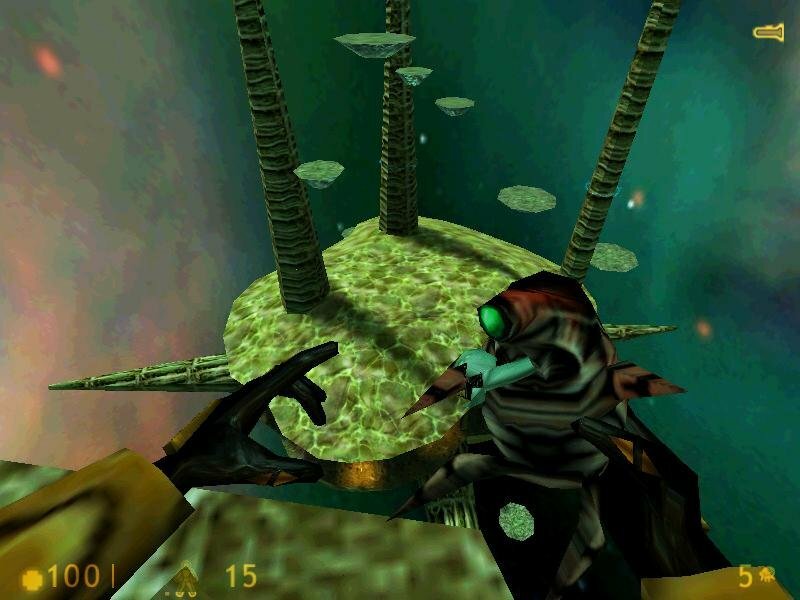 At one point you have to make your way down a gigantic, circular blast chamber with a three-headed ‘Tentacle’ spreading from the center. Then you’re using a controllable freight locomotive to travel between storage facilities, surrounded by electrified rails and angry soldiers. 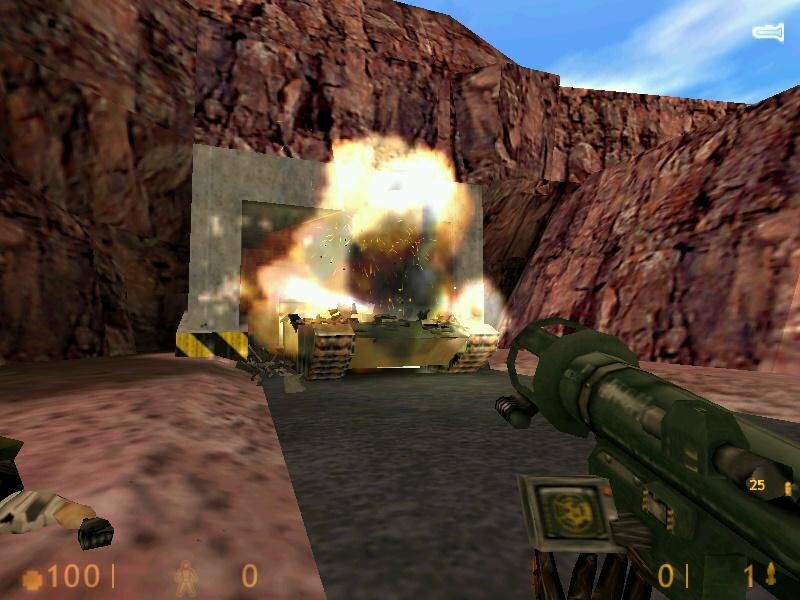 Some of the best and toughest levels are found towards the end, when you finally break the surface and are immediately met by roaring machinegun fire, tanks, APC’s and attack choppers all trying to stop you. 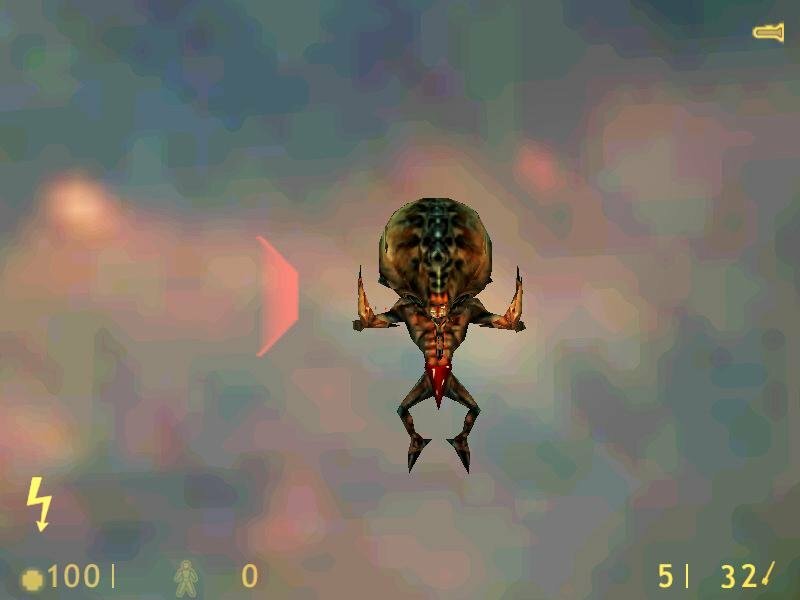 The ending levels will actually have you teleport into the alien world itself for a final, exhausting battle. Levels are ingeniously and logically stitched together in bite-sized portion, allowing for quick load times between sections and a greater sense of fluidity. 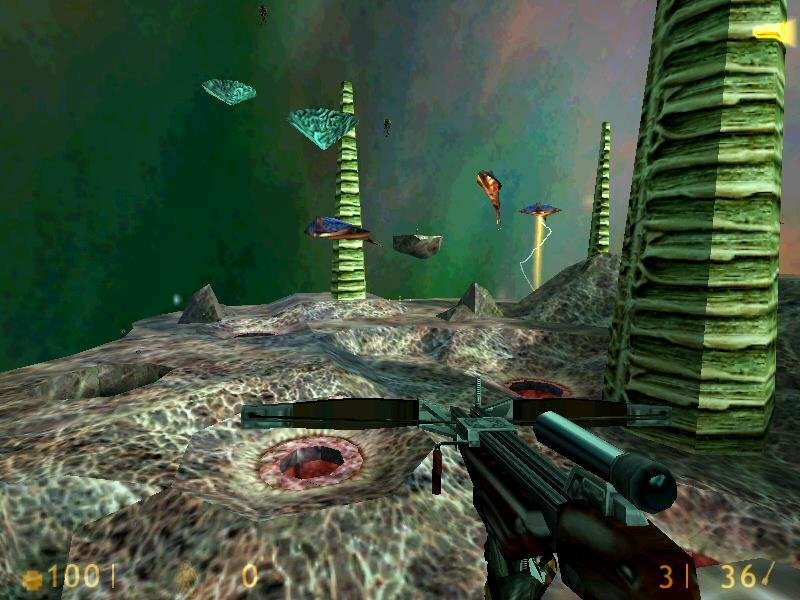 A view of Xen, the alien world. Tearing through the space-time fabric is remarkably easy. Toxic radioactive waste leaking everywhere. 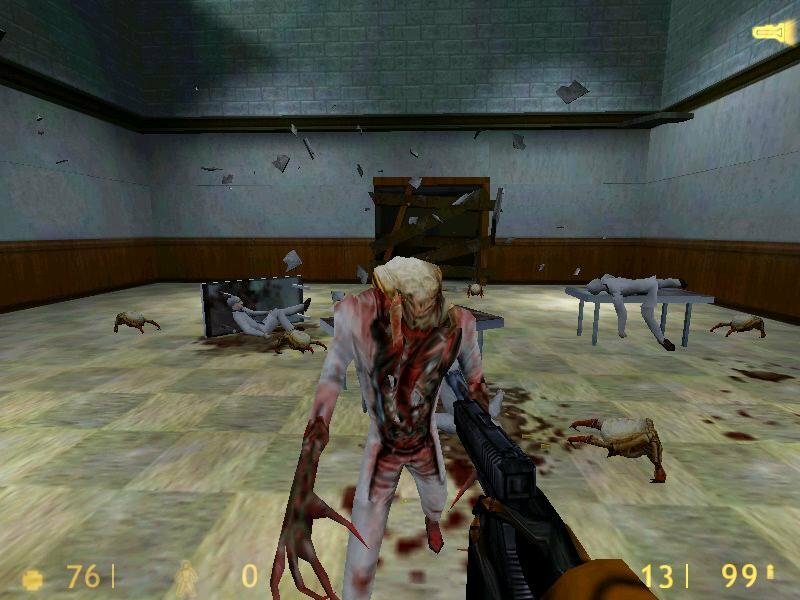 Visually, the game is still an interesting treat – bleak hallways and storage facilities inside the old research complex feel cold and desolate, while sunny outdoor areas seen throughout the later part of the game look warm, almost inviting. 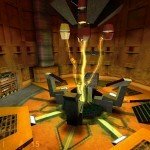 The range of visual effects is greater than anything done in the original Quake 2 engine it’s based upon. 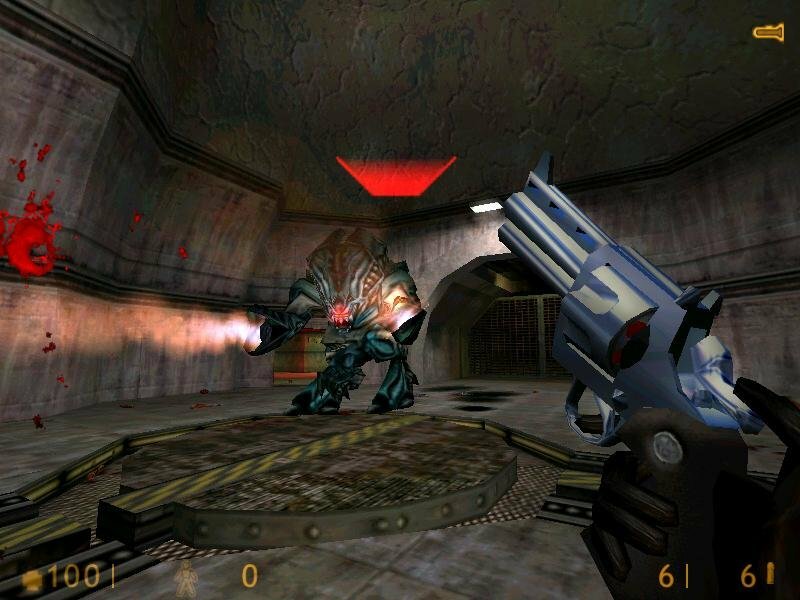 Valve licensed the engine from id Software but had modified it to a point where about 70% of the code is brand new. The final result is stimulating, but still lacking the visual mastery of some other high-end shooters from the same period… most notably Unreal. On the brighter side you’ll have several cool effects to compensate, including a revolutionary skeletal animation system that gives characters lifelike movements. 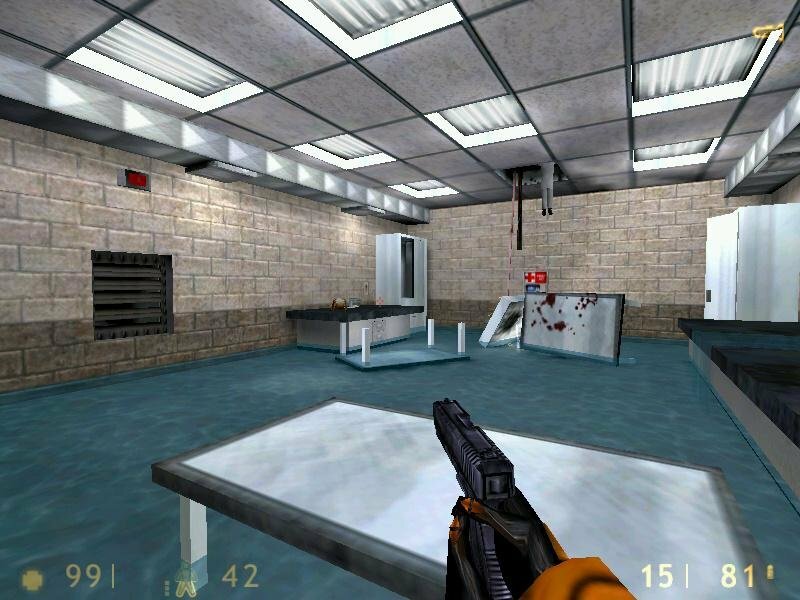 And of course there’s the decal system that allows blood, bullets and charred holes from explosives to be sprayed all over the walls in a realistic fashion. So while the graphics might not be top-of-the-line, they are most certainly adequate enough for this blockbuster. 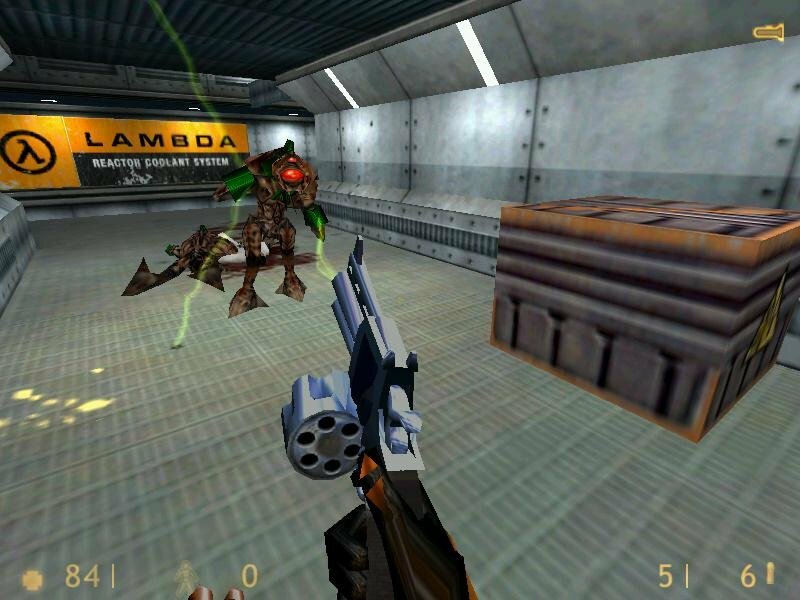 Concluding, Half-Life is a remarkably fun and memorable journey into one of action gaming’s most defining pivot points. The amount of mods and third-party customization tools available for the game is staggering, and I need not mention the visual upgrades released over the years to enhance the game in every aspect. But it’s just as enjoyable without the added high-res flourishing. Perhaps most refreshing is the general air of mystery – with this game, the series is still at an incipient phase where most of the story isn’t fleshed out yet, leaving much of what is happening here up to the player’s imagination. In other words, there are no Combine, no giant robot dogs and no gun-totting pastors to derail you from the action and sleek sci-fi motifs. The game radiates with cool all by itself, and any true action gaming fan should play it! Problem solved. I’ve read your “read this first!” link on your site (Random applause please)…and there was a link to several serial-codes. The first one I picked worked. Sorry for stealing your time. But for correction, there’s no keygen in the downoad file included. I searched every folder and unpacked it several times new. I can not play this game online multiplayer, how to fix this problem? 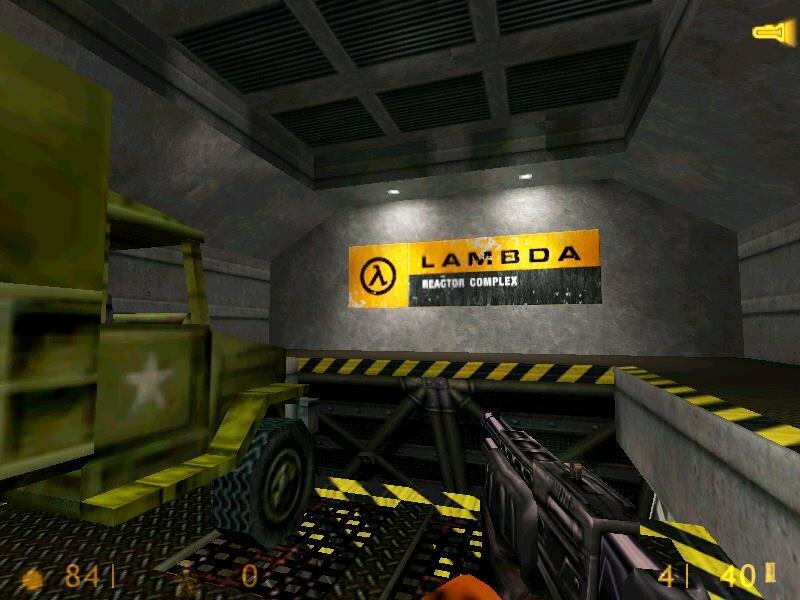 When ever i try to start Half Life, it keeps saying “Half-Life” “Your Half-Life \executable has been modified. 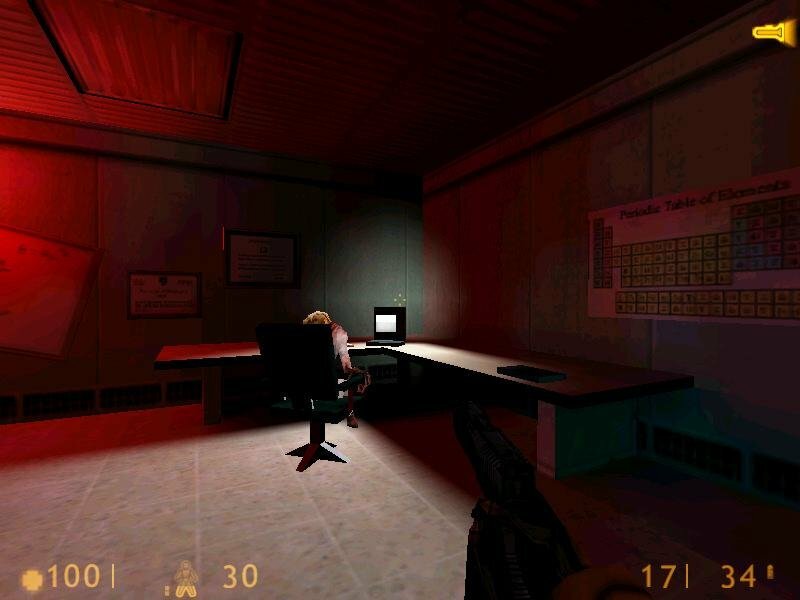 Please check your system for viruses and then re-install Half-Life.” How to fix this problem? Thank you! This is the most wonderful site! Fantastic job! Don’t open it as an archive. Download and install PowerISO then mount the MDF, then install the game. The patch is optional. You could also install utorrent and click on the green button. that file pack also has the full HL installer. I deleted the comment for you. Got it working? If not, download youtorrent and download the magnet link. It has an installer version that is easier to get working. 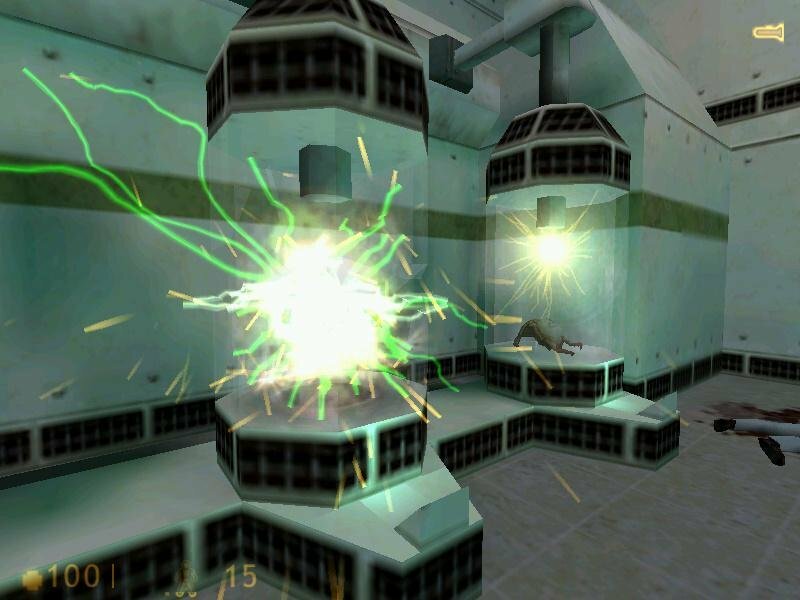 One wrong thing in Half-Life’s engine: there are no real dynamic lightning. 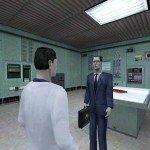 If you switch off lights in room with two scientists in it (in begining of game), you will see falling light on floor in front of closed door. Open door, then it looks logic. 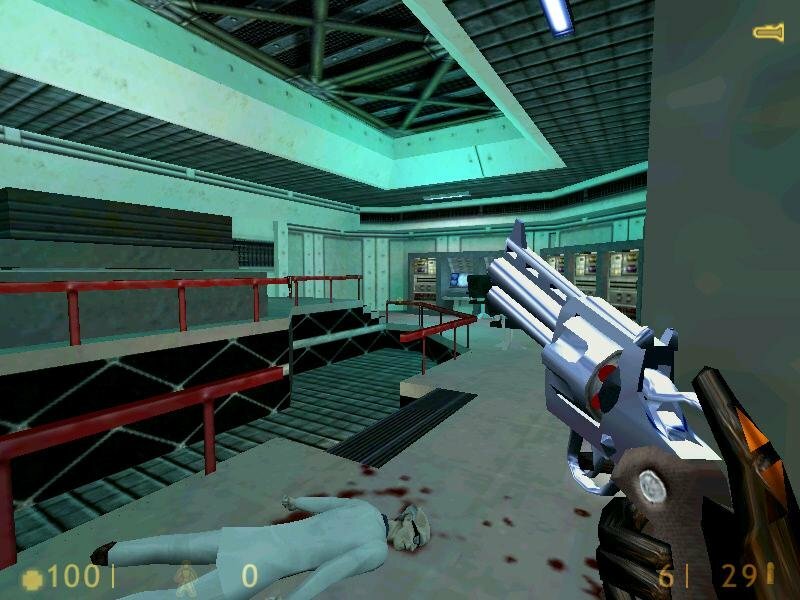 But i uderstand Valve was working extremely hard on game’s story, gameplay and all content, so this part is PERFECT. 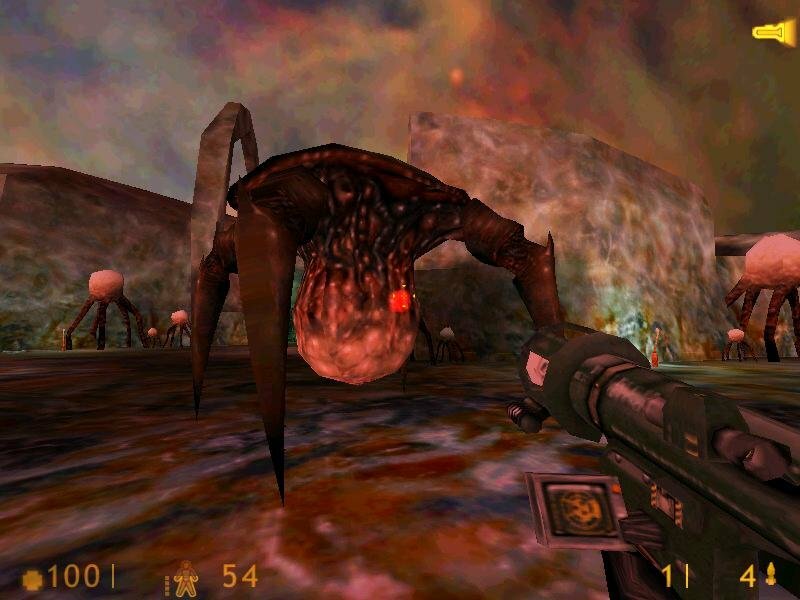 Half-Life was amazing (it still is). I played Half-Life Day One (demo version). And played it again and again. Then I bought it on December 1998. This game is so powerful. I just got the virus. 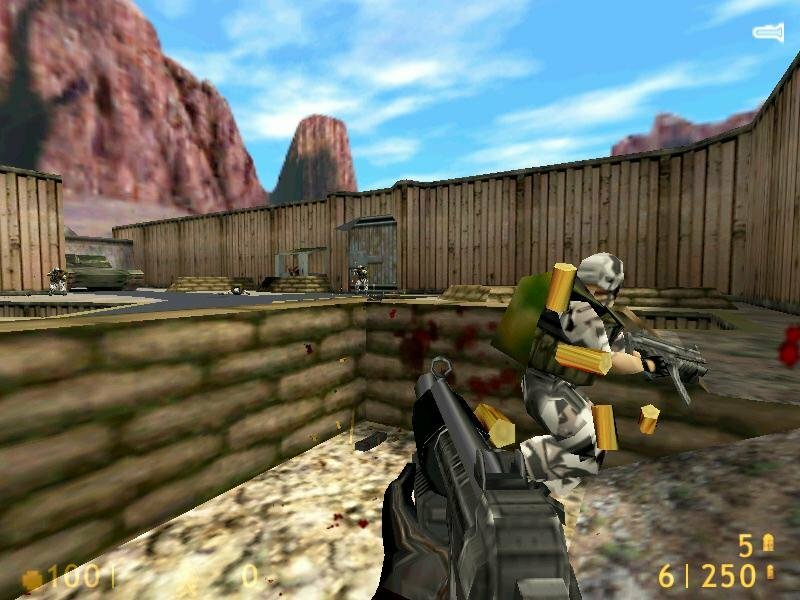 Fantastic game,fantastic graphics for that time,gameplay,the game was very and is still the best fps game i ever saw. 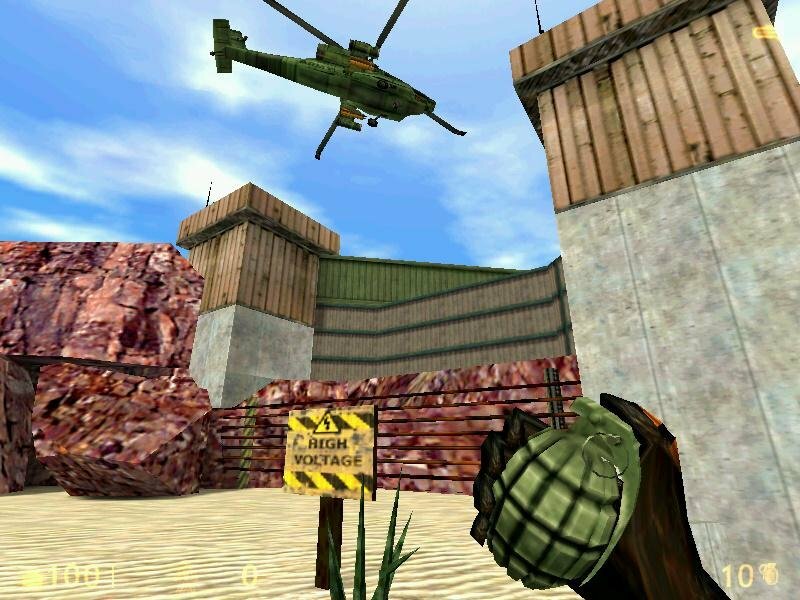 It is normal to have 1000 fps at this game?now i can bring back some memories. No but that will happen if you have a fast processor that the game was not designed for. HOW TO GET CD KEYS? It’s literally the comment above his. Plus there’s also a keygen in the rar. Hopeless. i see it and now i play the game but how to enable cheat? AAAA x 4 doesn’t work (as there are five blank spaces) but AAAAA x 5 works! Thanks. Thanks a lot! Btw, works with Sven Coop? after instalation…….the game won’t start at all (i have the installer version)…help? run it on the virtual machine (see the tut video, it works on it). When I run the game, it crashes on when I click the link to start playing the game. Is there a fix? Are you blind? I don’t know how to help you. 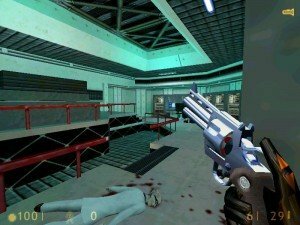 OldPCGaming can you,please, tell me if i can play HL on multiplayer (or TF and HL Deathmatch)? Do your games contain all the files? i download most of the games from here and I am a fan. but still… I am just asking. 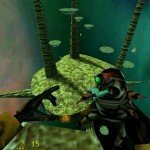 Use utorrent and download the magnet link to get all files (HL+expansions). Otherwise you get the regular files without expansions. This is not a problem but I will be glad if you could tell me, how can i get low definition pack for all three games? Thanks in advance! P. S. They all come with HD pack by default. 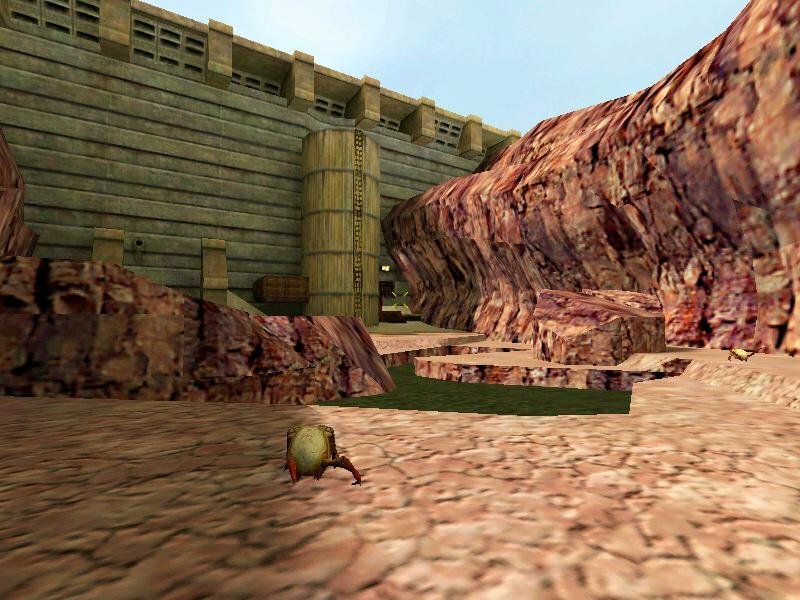 If you install the CD version then you get the 3d models seen in the screenshots. Sorry for bothering. 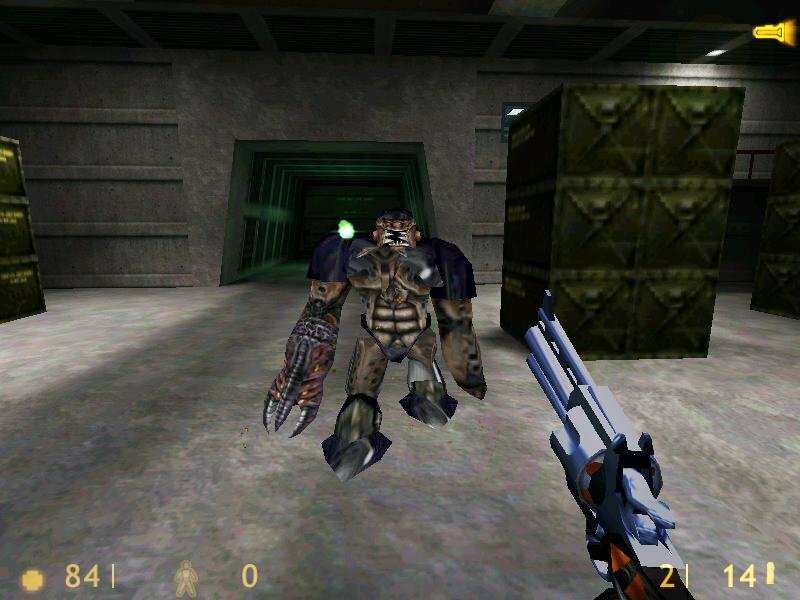 But there is only CD version for Half Life, not for Opposing Force or Blue Shift. Thanks again! Ahh, thanks again. I’m just as careless. Thank you for the effort you are putting in and keep the great work going on. Hello, I just wanted to know, is there anyway I can play an older version of the game? Like 1.0.0.5? my daemon tools asks for a password… what is it?